You'll never go broke taking a raw form of music or two, smoothing off the rough edges and presenting it to the public in a pretty package. Just ask Col. Tom Parker, Elvis's first manager, and a host of others like him. Michael Franti and his group Spearhead exemplify that logic to the max. Franti, a handsome guy whose pedigree reads like a roll call at the United Nations, takes elements of reggae, hip hop, rap and even that mongrel rock and roll, soups them up under a banner of joyful affirmation, and is just bound for big-time airplay. 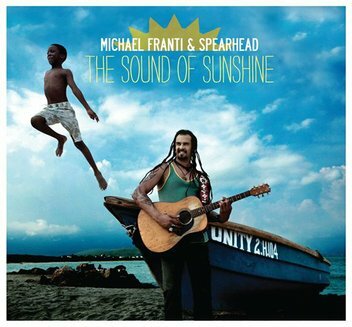 From the hopping bass and brisk acoustic guitar of the CD's title song - which has that zest for life you find in Walking on Sunshine or Rise Up - to the hip hop dance beat of Shake It, to the big, thumping pop-rock of Hey Hey Hey, Franti is like a clear, gushing fountain of positivity. No matter how bad life is, live it to its fullest is the message of that last song. And in the basic reggae beat of Anytime You Need Me, well, you guessed it, he'll be there. In I'll Be Waiting, he tells us the best things in life aren't things, and that he'll be waiting for that special woman. Whether it's a song to a woman, an exhortation to get up and dance, or a message about waiting for the storms of life to pass, Franti synthesizes all his sources of music into one, big, happy, pop-world beat message. Wow, here's a buffet of the blues for you. Joe Louis Walker, along with his band Blues Conspiracy, is joined by a whole troop of great players, including Johnny Winter, Duke Robillard, Tommy Castro, Kenny Neal, and many others, in concert. Joe stresses in his liner notes that the whole set's live; no overdubs. He kicks things off with the rollicking, good time R & B of Slow Down GTO, featuring a horn section, some heavy Hammond organ from Mike Finnigan, and a guitar solo that's so wild and gnarly it sounds as if Joe pulled it through a knothole backwards. He's got the bouncing R & B of Lowell Fulson's Ten More Shows to Play, about a man forced to choose between his job and his woman back home, and the wild and woolly rockin' R & B of Nick Gravenitis's Born in Chicago. There's the low down, organ-backed slow blues of Sugar Mama, with its long intro duel of harp and guitar, and the classic electric blues riff of Amos Blakemore's Poor Man's Plea. Walker closes the album with another bouncing R & B number, 747, on which he scorches the CD machine with a guitar solo that almost beggars belief. It's stunning to think that musicians like Walker are out there playing gig after gig and making albums, and the average listener barely knows who they are.